Now let’s go to the upper-left quadrant. Here I have “strategist.” Imagine an individual who does not have a team, but comes up with amazing strategies for driving an organization forward. The strategist has heavy influence in that it sets the organization’s direction. This is, in essence, the definition of a leader. A leader sets a strategy and then others execute this strategy. Under this model, a leader does not have to have direct reports or a team to be a leader. The strategy produced is what leads. Now let’s go to the lower right corner. Here we have “strategy executor.” This is the section where I consider it closest to people and team management. This is what I think of when I think of “managing.” In order to execute a strategy, you need some set of resources and that usually involves a team of some sort. Whether it is direct reports, temporary staff, an outsourced partner, or a virtual team, this “strategy executor” needs people management and team management skills – the kind that are discussed extensively in this blog – to get the work done to execute the strategy. And this involves managing a larger group if the strategy requires more than one person. 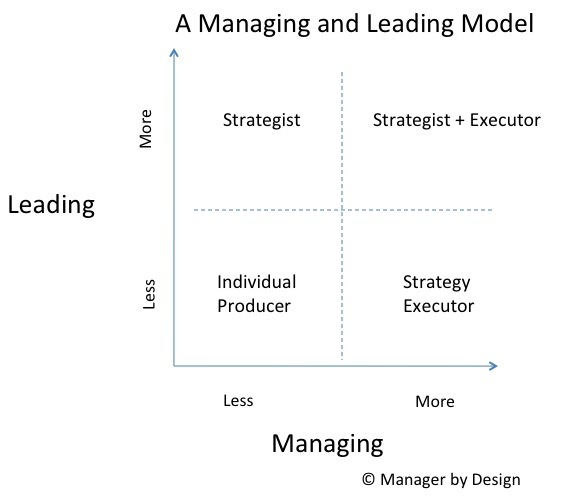 Then in the upper right quadrant we have the “strategist + executor”. This is a combination of the two roles that consciously separate out “leading” and “managing.” Someone in this role must do both – set strategy and make sure the strategy is executed. They are a leader and a manager. When looking at it this way, you can see that leadership and managing, while often conflated, are two different things. We tend to think of a leader as being exclusively in this category – someone who not only must produce a strategy, but also execute that strategy with a team. Often, we think that the larger the team, the more the leadership. What do you think of this model? In future articles, I’ll discuss how this model helps us in the emerging field of management design.